Affliction, based on a novel by Russell Banks, is written and directed by Paul Schrader, and, like so many other Hollywood products these days, it asks us to believe that traditional ideas of masculinity are psychically and socially destructive. Though it is well-written, well-acted and well-photographed, the movie really has nothing else to say to us apart from that. Sensitive males are good, while tough-talking males, especially fathers who enjoin their sons to "be a man" are bad. In fact, they are very bad. I guess it would be too much to hope that somebody making a movie in the1990s might, while preferring the sensitive male himself, acknowledge that the macho man does have his uses. At any rate, nobody does here. 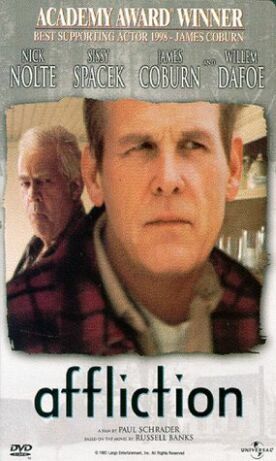 The main character is the not-very-bright Wade Whitehouse (Nick Nolte), who is village policeman and well driller in the employ of Gordon LaRivière (Holmes Osborn) in a remote New Hampshire hamlet. Recently divorced from the stuffy Lillian (Mary Beth Hurt), he is trying to be a father to his daughter, Jill (Brigid Tierney) but the whiny child doesn't want to be with him and keeps asking if she can go home. A younger friend, Jack Hewitt (Jim True) gets the job of guiding a guy from Massachusetts on the first day of deer season—and of making sure he shoots a deer. When, instead, he shoots himself, Wade gets it into his head that Jack has shot him for pay, at the instigation of criminals against whom he was shortly to testify. Wade soon finds that his suspicions (which seem not to be well-founded) are getting him in big trouble, and he loses his job, his parental rights over his daughter and his girlfriend, Margie (Sissy Spacek) because of his pointless, impotent rages. But the ostensible plot is really an irrelevancy here. The real cause of Wade's boorish and violent behavior is the abuse he endured as a child at the hands of his brutal, drunken father, Glen (James Coburn). There are flashbacks on smudgy videotape that looks like home movies to scenes from childhood as Wade and his much smarter younger brother brother, Rolf (Willem Dafoe), are shouted at, sometimes hit and often taunted by the old man: "What are you?" he says. "A quitter?" Later Wade says the same thing to his daughter. The horror! Rolf is now a college professor and a very sensitive male, and it is he from whose point of view the story is told. Wade decides to get married and takes Margie home to meet his parents. They find the house freezing, the furnace broken, everything in a mess, Pop drunk and mom upstairs in bed, dead. "It makes me sad," says Pop, "it was her 'stead of me. I should have froze." Amen to that, we are meant to think. In vino veritas. Likewise, when the death of poor abused mom brings to the house Wade and Rolfe's sister Lena and her husband, who are Christians (Pop laments that his children are "Jesus freaks and candy asses"), and they try to pray with the old man, he curses them and says, drunkenly, "not one of you was worth one single hair on that good woman's head." Lena tells him that "Jesus is more powerful than any demon," but Messrs Schrader and Banks know better. It is the priggish yuppie, Lillian (whom we cannot imagine as having willingly married Wade) who speaks for them when she says of the late Mrs Whitehouse, "We'll never know how women like that suffered. It was like they lived all their lives with the sound turned off. And now they're gone." Boy are they! But Wade, caught in the middle between the old patriarchy and the brave new feminist world, is too stupid and psychically scarred to know how to function among mannish women like Lillian and effeminate men like Rolf and so is driven back on the violent streak inherited from dad. Rolf says,"At least I was never afflicted by that man's violence." Wade, in his only moment of insight in the film, replies: "That's what you think." Fortunately, Wade's own violence is directed, at least in the first instance, against dad himself. Then, as we know he must, he goes and does something stupid—though the thread of connection to paternal abuse is by this time stretched to snapping point. The voiceover narration by Rolf blames it all on their both having been among the sad congregation of "boys and men beaten by their fathers" as a result of which "the capacity for love and trust is destroyed" at the beginning of their lives. This is "the tradition of male violence" that he, Rolf, congratulates himself for having escaped. Good for him, I suppose—at least until he needs an army full of those "violent" males to protect him.